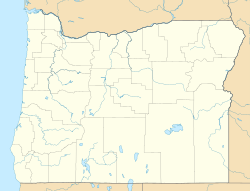 Tumalo (/ˈtʌməloʊ/ TUM-ə-loh) is an unincorporated community and census-designated place (CDP) in Deschutes County, Oregon, United States. As of the 2010 census it had a population of 488. In the Klamath language, tumolo means "wild plum," a plentiful shrub in south central Oregon. Tumola means "ground fog," which may have described Tumalo Creek. Tumallowa, the original name of Tumalo Creek, means "icy water." Tumalo is in north-central Deschutes County on U.S. Route 20 between Sisters, 15 miles (24 km) to the northwest, and Bend, the county seat 7 miles (11 km) to the south. Eagle Crest Resort is 9 miles (14 km) to the northeast. According to the U.S. Census Bureau, Tumalo has an area of 1.7 square miles (4.4 km2), all of it land. The town lies along the Deschutes River. Tumalo Creek joins the Deschutes 3 miles (5 km) south of the town. The town was originally called "Laidlaw", after W. A. Laidlaw, the town promoter. The Tumalo Irrigation Project and Tumalo post office had been established in 1904. Although the project ended and the Tumalo post office closed in 1913, by 1915 residents of Laidlaw changed the town name to "Tumalo". Due to population growth in the Bend area a new zip code was added effective July 1, 2015. The new zip code, 97703, changed the zip code of Tumalo from 97701 to 97703. ^ a b "Geographic Identifiers: 2010 Demographic Profile Data (G001): Tumalo CDP, Oregon". U.S. Census Bureau, American Factfinder. Retrieved December 14, 2015. ^ McArthur, Lewis A.; Lewis L. McArthur (1982) . Oregon Geographic Names (Fifth ed.). Portland, Oregon: Oregon Historical Society Press. p. 746. ISBN 0-87595-114-7. ^ "ZIP Code in Portions of Bend to Change on July 1st". about.usps.com. Retrieved 2016-06-28. This Deschutes County, Oregon state location article is a stub. You can help Wikipedia by expanding it.